Visit along with TravelCrete.Tours Palace of Knossos. Your Guide will take you through the palace of Knossos, a bewildering complex of more than 1500 interlocking rooms, a true labyrinth, was more than a cage of the gruesome Minotaur… It was an astonishing palace, built for a mighty king of the Bronze Age. As we wander through the labyrinthine ruins you will have the chance to see the original throne of ‘’Minos”, still in place after 3,500 years; the mystifying sanctuaries, the luxurious Domestic quarters of the Royal family, the once upon a time bursting with Crete’s treasures pantries and the astonishing water-management systems, just to name a few of the minoan wonders! Knossos, the capital of Minoan Crete is located about twenty minutes south of the modern port and town of Heraklion and is considered Europe’s oldest city. In the seventh millennium BC a small community of hunters and farmers set the foundation of the islands long history, which lasted for thousands of years. The peak of the Minoan culture lasted about six hundred years, from 2000-1400 BC. 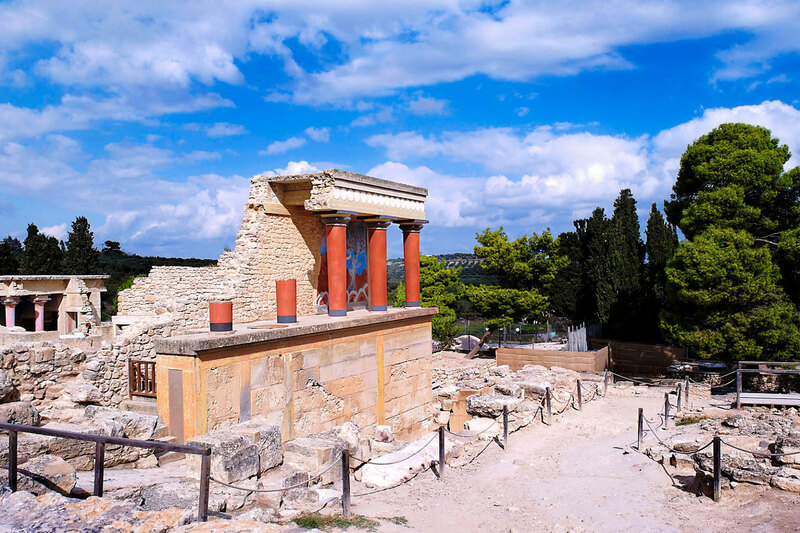 The first palace of Knossos, close to the Kairatos river, was erected soon after 2000BC, when the Pyramids of Egypt and the Stonehenge were just a few hundred years old. The wealthy palace, seat of the ruler and the civil/religious authority was the perfect arena of power display in the elaborate palatial feasts with exotic materials shipped from the Aegean, Levant and Egypt. The happy life of its residents came to an abrupt end in 1700 BC when a catastrophic earthquake destroyed the Palace but did not reverse the cultural dynamics of Minoan Crete.